Dr Pepper is a true Texas original, and its unique flavor is beloved all across the Lone Star State. Invented in Waco in 1885, Dr Pepper's 23 flavors have been delighting Texans' taste buds for over 130 years now. How much do you really know about the iconic soda? Since its inception, the soda has expanded to numerous flavors including Dr Pepper Cherry and Diet Dr Pepper, but the original will always be the classic. Here are 10 Dr Pepper facts you may not know. While the recipe and its ingredients have always remained proprietary, Dr Pepper began selling the syrup (which is then mixed with carbonation and water) to bottling plants around the nation, granting them franchise bottling rights. The first franchise operation was in Dublin, Texas. Inventor Charles Alderton began mixing what is now known as Dr Pepper at Morrison's Old Corner drugstore where he worked in order to boost sales at the soda counter. Though Dr Pepper is a multimillion dollar operation these days, Charles Alderton was primarily a pharmacist, and not interested in becoming a soft drink manufacturer. He sold the recipe to drugstore owner Wade Morrison and chemist Robert Lazenby, who began bottling and marketing the product. If you think Dr Pepper is popular in Texas, you'd be surprised to learn that Roanoke, Virginia is considered "The Dr Pepper capital of the world". What won't surprise you, though, is that Dr Pepper's popularity in Roanoke is due to the efforts of a Texan. Bill Davis left a job in the oil industry in the Lone Star State to open a Dr Pepper bottling franchise in Roanoke, and his marketing efforts changed the city's soda preferences for good. There are many imitators of Dr Pepper here in the United States, the most obvious one is Coca-Cola's Mr. Pibb. But in the Netherlands, the popular knockoff has a less than an appetizing name. In 1982, Dr Pepper sold franchise rights to a bottler in Bavaria. The agreement came to an end in 1995, at which time the bottler began selling a similar drink, which they named after Woodrow Wilson "Foots" Clements, the famous chairman of the company. Thus, Dr Foots was born. In 1885, soda fountains did not consist of push lever machines that automatically dispensed drinks, the way they are today. Instead, soda fountains consisted of a clerk who would hand mix carbonated water with different flavored syrups (similar to snow cone syrups). The scent of the sugary sweet syrups would permeate the air near the soda counter. This is the scent that inventor and pharmacist Charles Alderton was trying to capture in combining the 23 flavors that make up the iconic soda. 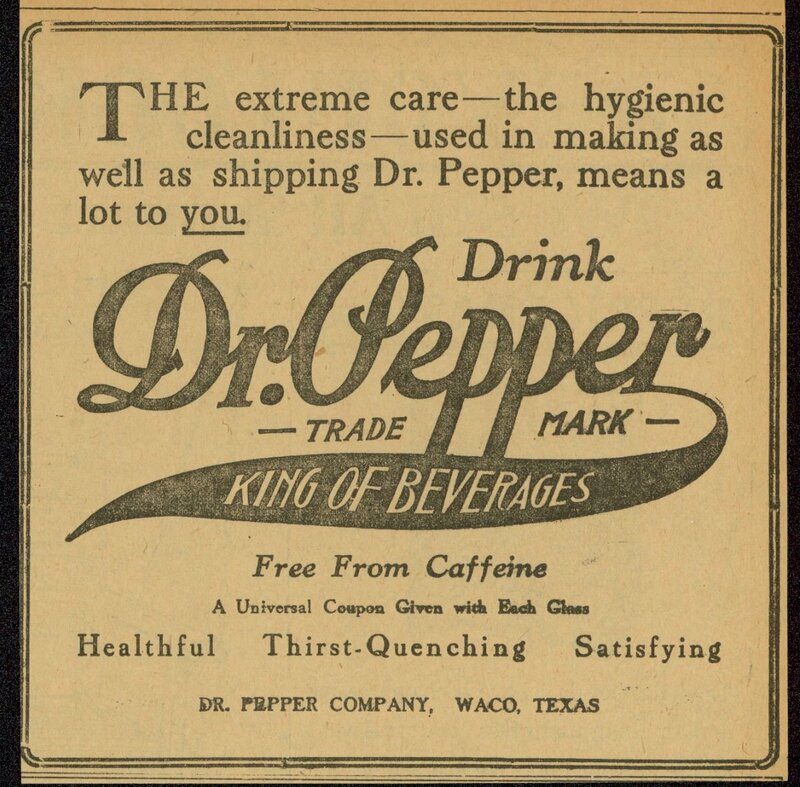 Dr Pepper predates Coca-Cola by one year, making it the oldest soft drink in the nation. Though it had already been successful in Texas for many years, the soda really became an American treasure after its appearance at the 1904 World's Fair in St Louis, Mo. Some other new inventions that also debuted at the 1904 World's Fair were x-raying machines, waffle cones, and the electric typewriter. The Dublin bottling plant was famous for years in Texas as the only location that continued to sell Dr Pepper made with real sugar instead of high fructose corn syrup, but that changed in 2012 after they were sued by the Dr Pepper Snapple Group. 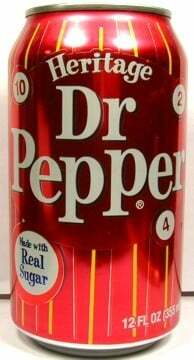 However, Dr Pepper sweetened with real cane sugar is still available in the UK and other foreign countries. "Heritage Dr Pepper" made with cane and beet sugar was released in the United States briefly in 2011 but was not successful enough to continue. Though the soda had its beginnings in Waco, Texas, the headquarters moved to the Dallas area in 1923 and has remained there ever since. The current headquarters is in Plano, just north of Dallas. Though it has often been said that one of the 23 flavors of Dr Pepper is prune juice, the company officially put that rumor to rest on its website by stating, "Dr Pepper is a unique blend of natural and artificial flavours; it does not contain prune juice." This post was originally published on January 17, 2017.